Registered to report the same issues. Currently at 12GB memory usage, web protection refuses to start. Problems began at about 11am EST. I have the MBCheck zip file, but I'd rather email it to support than upload it to the public. For me too! For a paid program this is not permissible! The computer just started up. I suggest turning the program off until it's fixed, or else it will keep growing till it will crash your computer. mbamservice has to be stopped manually! Having the exact same issue had to uninstall because it wasn't going away. 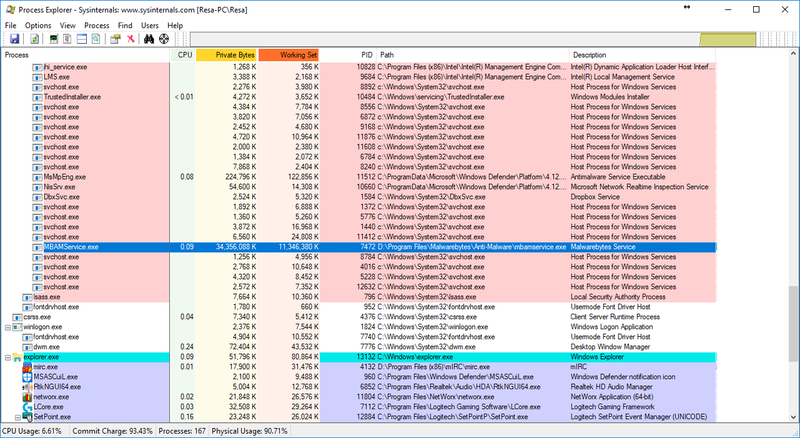 Got the same memory leak just this morning from Malwarebytes, a buddy too . Shut down Malwarebytes and its fine . 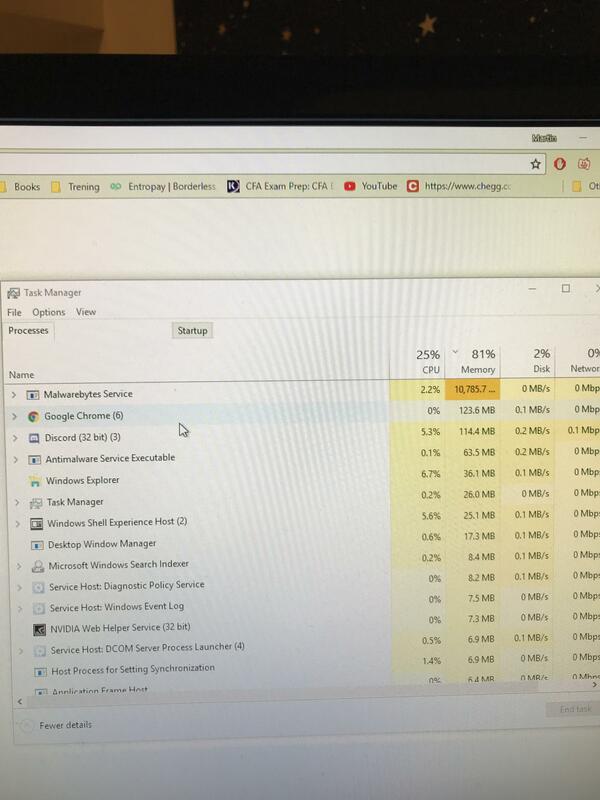 I have 32GB installed and memory usage went up to 40% at start up and would increase 1% every 5 seconds . 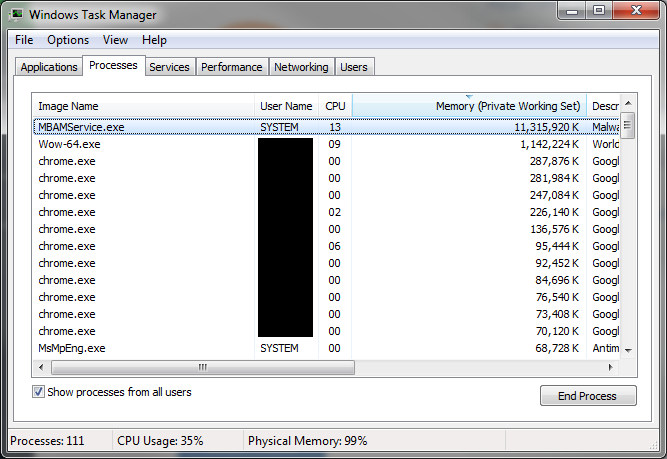 Massive memory leak that eventually crashed my PC. I would love to have this program running, but I cannot. Please fix ASAP. Malwarebytes, having to remote into work on my day off and remove your software to ensure my customers remain up and running. This is completely unacceptable and needs to be fixed ASAP. Also experiencing this. Crashed half my system, and almost crashed WoW while I was healing a run. Kept turning itself back on and crashing so I've just uninstalled for now. This needs fixing ASAP. Same thing happening to me, memory over 10GB, web protection disabled, real time just disabled itself as well. Computer crashed hard right before this too. Same here... Get your stuff together bois. Happened to me too, had to uninstall the damn thing. Get your stuff together malwarebytes, this is stupid as hell! PC is completely fine when I close MBAM. Web protection was getting turned off and unable to be turned back on at startup. MBAM ate through 16gigs of my memory (all of it) before completely crashing PC. Registered an account to confirm this. This is freakin ridiculous. MB is suppose to protect our computers not kill them! First was the shields issue, then definitions that crashed the program...and now this!? Out of all my protection systems I've tried, this has to be the one that always have the most problems.